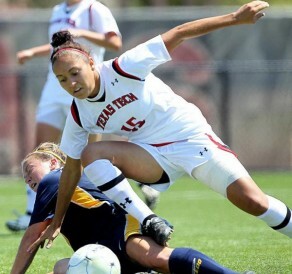 Texas Tech standout Jaelene Hinkle in action against Toledo. Seattle Sounders Women defender/forward Jaelene Hinkle was named to the United States U-23 National Team on Monday following her All-American season at Texas Tech. Hinkle will compete with other U-23 standouts under new U-23 Head Coach, Steve Swanson during the December 14-21 camp in Sunrise, Florida. The U-23 event will run concurrently with a U.S. Under-20 Women’s National Team camp and the teams will scrimmage against each other during the week. Posted January 9th, 2014 & filed under Sports.